Students from Robinvale P-12 have been given the chance to explore cultural identity in one of the most ethinically diverse communities in Victoria, and all through the process of making a film. The group is made up of 9 students from Tongan and Aboriginal backgrounds, the idea being to give all students an opportunity to explore their identity and relationship to each other, while developing filmmaking skills. The workshops are being facilitated by two Melbournians, Amie Batalibasi and Lia Pa'apa'a, who each have experience in community arts education and film production. The Robinvale project comes off the back of similar workshops held in Melbourne in 2011, that resulted in the film series Pacific Stories, where members of the Melanesian community got to explore their own past and tell stories through film dealing with language, art and other areas surrounding cultural identity. Now, the idea has been developed to incorporate the highly diverse border town of Robinvale, where 52 communities squeeze into a community built for just a few thousand people, a situation which has in the past brought about tensions between the communities. Two short films, running up to ten minutes each, will be developed as part of the project, with each student taking part as crew members and learning different aspects of the production process. 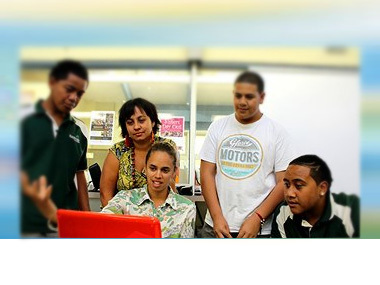 "The idea of this project is that we are facilitating filmmaking skills, so that each participant will have the ability to go off and create their own films," says Lia Pa'apa'a, one of the educators; but the workshops are not only about filmmaking. "Not only have we been doing the filmmaking process, but we've been talking about identity and being able to show films around that; and what that means for Pacific Islanders living on Aboriginal land and for Aboriginal people having other people on their land. "They're up for learning and for listening and understanding that," says Ms Pa'apa'a, who is quick to stress that the students are the ones leading this conversation. "It's always surprising how forthright they can be with their opinions", she says. Amie Batalabasi says she has been amazed at the eagerness which the students have shown to learn. "We usually do our project over six months, one class every week; this has been four days of intense filmmaking. "Lia and I as facilitators we're feeding them all of this information and they're just taking it in like sponges," she says. The project is auspiced by Robinvale Network House and has received funding from Arts Victoria and Swan Hill Rural City Council.